Whatever My Lot...: Web Profile . . . Web Profile . . .
Our adoption web profile is up on the Bethany website! I sent it in last week and have been checking the site every day to see when it would be up. Our profile books are also AT the agency, which means we could be shown to a birthmother any day now. Woohoo! Speaking of Christmas, I know I haven't really said...errr, written much about the holidays. I'm not purposefully avoiding the topic, but I really just didn't have time to write about it and now it seems too late. Suffice to say that we had a great Christmas, was able to see almost all of both of our families, and rung in the new year quietly, just the hubby and me. So, while blogging mobile-ly is convenient, I really miss all of my formatting buttons, so this probably won't happen much. Anyone else blog via tablet or phone? Suggestions are welcome! I CAN add a picture, though. So, here ya go! You know I love flashbacks! 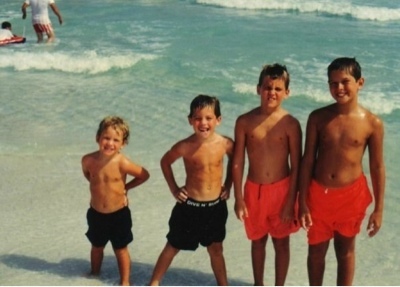 This is Hampton and his brothers when they were obviously much younger!